From Mrs. to Mama: Big Girl Syndrome. It's currently in our house. The whole my baby no longer looks like a baby. My baby walks like a big girl. Acts like a big girl. Sounds like a big girl. It's infested in our home. I called the exterminator. Unfortunately, they said this is a type of bug that they simply can't get rid of. It's one that we have to deal with for the rest of our lives. Sigh. It invaded our house too! How do we get rid of it?!?! Awh! She is getting so big! I bet you wish you could just keep her little forever!! It's invaded our house too and is growing at enourmous speeds! Kelcee is now 5 eeeeek! She is going to Kindergarten this fall I'm gonna pass out lol! Elli is so so cute! Love that outfit! Big girl syndrome is headed our way too! Can't believe how time has flown. Feel lik eyou were just pregnant with E! 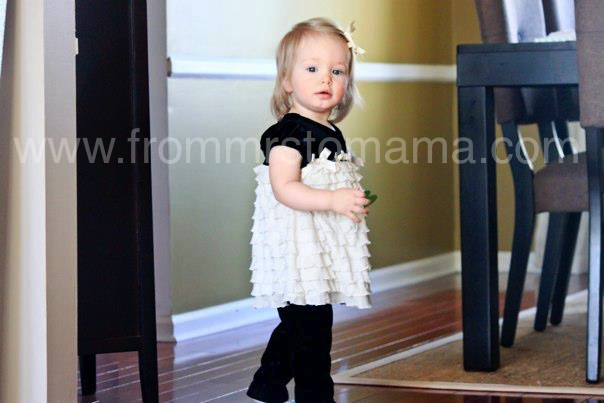 your little girl is soooo beautiful!!! It's crazy how fast they grow up! But you are the best momma and treasure every second of it :) Love this picture of her...she is gorgeous Becky. She got it from her moooommmmaaaa. Haha. awe. we have a big girl too. it makes me a little sad but shes so much fun! She is so beautiful :) This was a cute post! Her little outfit is so cute!! It's happened here too. It must be contagious. When you find a solution let me know! Hahaha, I hear ya! She is just so cute though!! Look at her hair too! It's definitely starting to get long. We need to get our girls in and get their trimmed but at the same time, I don't want to! Aww bless ... I do wonder now when the toddler stage starts, because my Josh is 10 months but he just isn't a baby anymore really because he has such a great little personality. Girl, she is getting so big fast! Specially from an outsider looking in. ahhhh yes i know this infestation as well! and it's not nice....it hurts mama...DEEPLY. My princess is going to kindergarten this fall and I'm soooooooooooo in denial and my baby boy is 2 now :( I think baby fever for #3 is setting in ! I'm not ready for Olivia to even turn 1! How fast time passes!! Weird - that same bug has infested our home too!! Not sure how I feel about it, either!! Although, I've been dressing Mason in 1 piece footed jammies just to feel like he's somewhat of a baby again! Why do they have to grow up so stinking fast?!?!!?!? I'm prepping for a 2 year Birthday and it seems like just yesterday I was pg! Sniff sniff. She looks adorable in that little outfit! Holy cow! She REALLY does look like a big girl in this photo. The good news? She's just getting more beautiful!